City of Tripoli, Africa, on the east coast of the Gulf of Sidra. Little is known of the first settlement of the Jews there; according to local traditions, they came originally from Tripoli. The chief rabbis of the community in the nineteenth century were: Moses Hakmon, Isaac Boharon, and Raḥamim Farju of Tripoli; the last, installed in 1871, still holds office (1901). As rabbinical author must be mentioned Elijah Labi, a centenarian (1783-1883). He wrote the "Sefer Ge'ullat Adonai" (Book of God's Deliverance) (Leghorn, 1864), in Hebrew, and the "Oraḥ Yesharim" (The Path of the Upright) and "Menuḥah le-Ḥayyim" (Rest for the Living) (Leghorn, 1872 and 1882), in Judæo-Arabic; i.e., in Rabbinic characters and in Arabic-Tripolitan dialect. As a bit of history must be mentioned the kidnaping of a young Jewish girl by Arabs, in 1868, an affair that was only adjusted by the intervention of the Alliance Israélite Universelle and the European consuls. In 1901 the community numbered 2,000 Jews, in a total population of 38,000. It has two synagogues—the Low Synagogue, which is said to be very old; and the High Synagogue, of more recent date—and four Talmud Torahs, attended by 200 pupils. The community is governed by a supreme judge (Abraham Ḥabib in 1901), in addition to the rabbi and by three syndics ("gabbaim"). The salaries of these officials are paid from the meat-tax, amounting annually to 3,000 francs. There are two societies: the Ḥebra Ḳaddishah, a burial society, and the Biḳḳur Ḥolim, which furnishes medicine and physicians to the poor. The Jews of Bengazi are prosperous. The majority trade in wool, barley, and butter. Others follow trades, as jewelers, tinsmiths, carpenters, etc. A Jew, Hamus Români, is one of the higher officials of the Serail, or administration of the department. The richest families are those of Tchuba, Youeli, and Ḥakmon. There are very few poor. 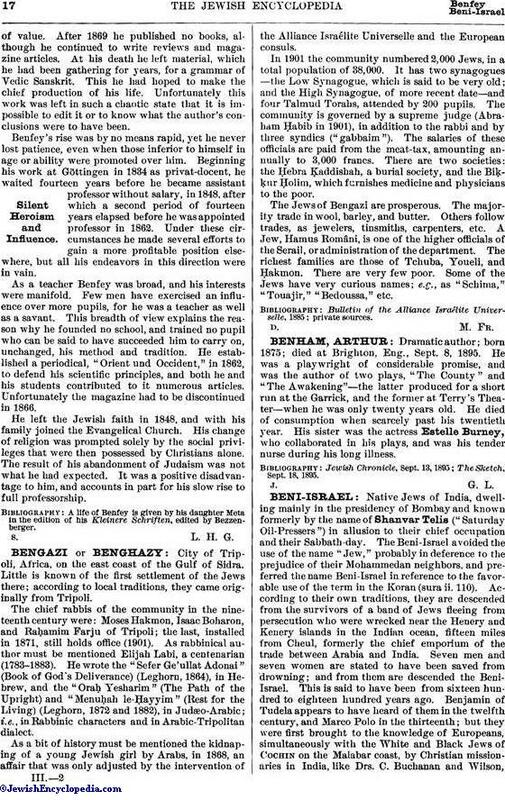 Some of the Jews have very curious names; e.g., as "Schima," "Touajir," "Bedoussa," etc.